(Newser) – Greek astronomer Hipparchus is known as the father of trigonometry. But the Guardian reports Babylonian mathematicians may have gotten there 1,000 years earlier. 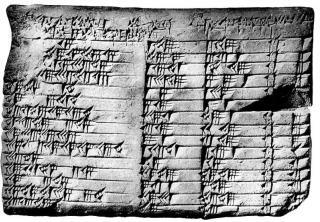 Ever since the real-life inspiration for Indiana Jones discovered a 3,700-year-old clay tablet called P322 in what is now Iraq, historians and mathematicians have debated the meaning of the rows and columns of numbers on it, according to Science. In 1945, mathematicians realized those numbers contained the Pythagorean theorem for deducing the sides of a right triangle a millennium before Pythagoras had coined it, ABC reports. And in a study published Thursday in Historia Mathematica, Australian researchers believe they finally know what those mysterious numbers are: a trigonometric table more accurate than any we have now. If as many could understand Sanscrit written in cuneiform this and more might have been discovered earlier. But cuneiform, hieroglyphics, Hebrew before diacritical marks, etc were all difficult to decipher and understand were they not? As writing styles developed that allowed easier and faster dissemination and retention of ideas along with more and better schools of higher learning (almost exclusively supported on the back of slavery and later serfdom in its various forms) more history of the development of knowledge from that point onwards occurred too, didn't it? Who knows how much genius occurred before that only to be covered by the sands of time? It is a challenge for a great many of us just to get the sands of sleep out of our eyes each morning. ok, maybe the Greeks didn't invent trig but they did invent the pap smear. Gus Portokalos is not going to be happy.